Ohio is commonly referred to as the Buckeye State due to the prevalence of Ohio Buckeye trees within the state's borders. 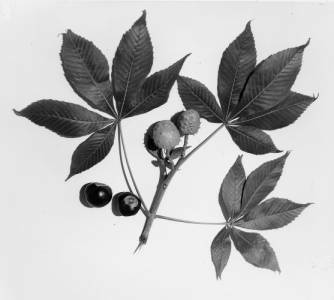 In 1953, the Ohio legislature designated the Aesculus glabra or the Ohio Buckeye as Ohio's official state tree. The tree is called the buckeye tree because its nuts resemble the shape and color of a deer's eye. The buckeye tree is relatively common to Ohio, growing especially well along rivers and streams and in floodplains. Besides the state nickname, the Buckeye Tree has also provided Ohioans with other symbols. The Ohio State University has adopted Brutus Buckeye as its mascot. Ohioans have referred to themselves as Buckeyes since at least the presidential election of 1840, when Ohio resident William Henry Harrison won the presidency. Harrison's supporters carved campaign souvenirs out of buckeye wood to illustrate their support for their fellow Ohioan.